The Tsukigase Bairin (Tsukigase Plum Valley) spreads along the valley of the Satsuki River that runs through Mt. Tsukigase-oyama, and contains about 13,000 plum trees. 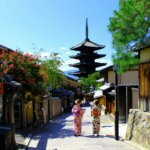 This plum-viewing haven is said to have started when plum trees were first planted in the grounds of a temple in the area around 800 years ago. On a clear day, from the very early morning until sunrise, fog rises from Satsuki River as the air cools, creating a fantastic view. There is a plum festival held every year from mid-February through the end of March in which visitors can enjoy events, food, and other festivities amongst the plum blossoms. Kairaku-en (偕楽園) is a 32-acre park known for its plum varieties, bamboo forest & monuments. It is regarded as one of the Three Great Gardens of Japan. It is also home to the famous Mito no Ume Matsuri (Mito Plum Festival), which has a history of over 120 years. 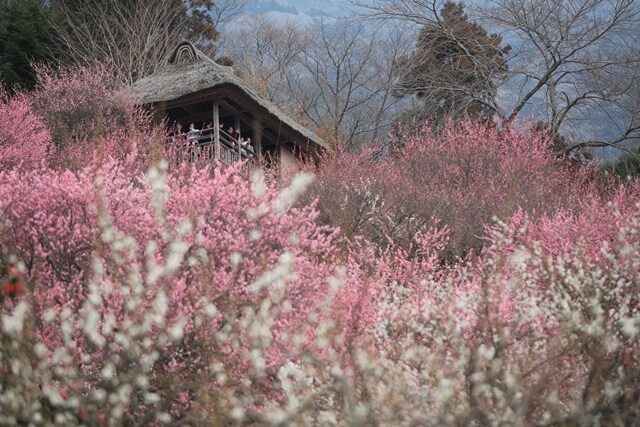 During the festival period, around 100 varieties of plums in park seem to compete to see which can bloom the brightest in a beautiful scene that signals the coming of spring. 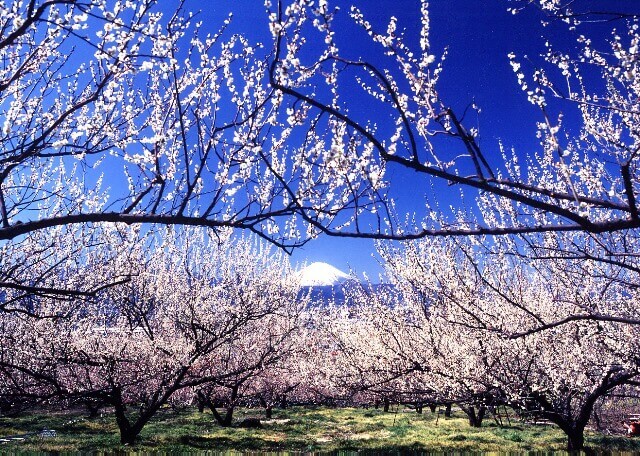 The Mito Plum Festival usually begins in mid-February and lasts until the end of March. 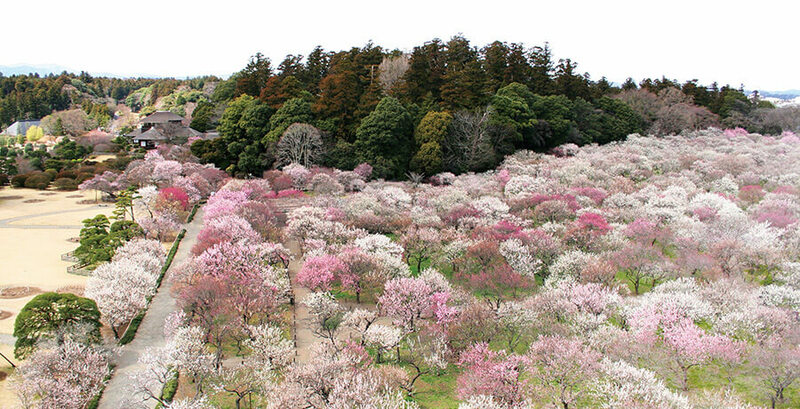 The Soga Bessho Bairin (Soga Bessho Plum Grove) is home to an incredible 35,000 plum blossoms. It is also one of the best places to see the summit of Mount Fuji in Japan. 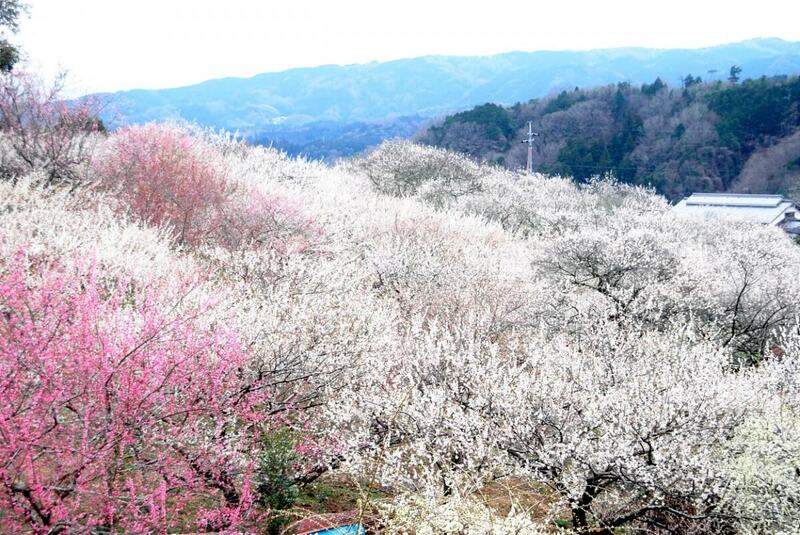 The combination of the beautiful pink and white plum flowers with the view of Japan’s iconic mountain make it one of the most popular places to view plum blossoms in all of Japan. Soga Bessho Bairin is actually a general term for 3 plum groves: the Nakagawara Bairin, the Hara Bairin and the Bessho Bairin. Soga Bessho Bairin is a main location of the Odawara Ume Matsuri, a plum blossom festival held every year during the month of February. Mount Tsukuba (Tsukuba-san) is an 877 m (2,877 ft) mountain located in Ibaraki Prefecture. 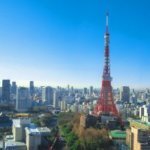 It is one of the most famous mountains in Japan, and on clear days, the Tokyo skyline, Lake Kasumigaura and even Mount Fuji are visible from the summit. 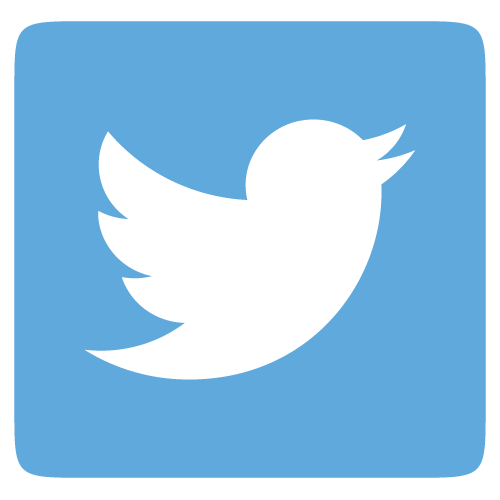 It is also home to close to 4.5 acres of trees, and the total number of trees is about 1000. Every year in early Spring, the plum blossoms are celebrated in an annual plum festival called the Tsukuba-san Ume Matsuri, or “Mount Tsukuba Plum Festival”. 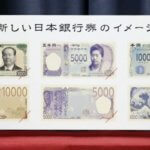 This festival is usually held from mid-February until mid/late March. There are about 30 kinds of plums, such as the white plum and the red plum, in Mt. Tsukuba’s municipal plum forest. 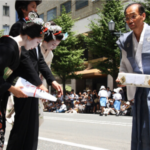 During the festival period, in addition to the events at the special stage, there are performances, a sweet sake service, a plum tea ceremony, and more. Atami Baien (Atami Plum Garden) is one of the prominent plum groves in central Japan. It was opened for public in 1886 and it is about 14,000 square meters in size. The garden is home to a wide variety of plants, but plant that dominates the most is the plum tree. There are 59 different kinds of plum, and almost 480 trees total – some of which are over 100 years old. Atami has been a popular area as a hot spring health resort for a long time, and the garden was first opened in order to promote exercise among those who were staying for treatment. The garden is not only a great place to see plum blossoms, but is also popular for its footbaths. 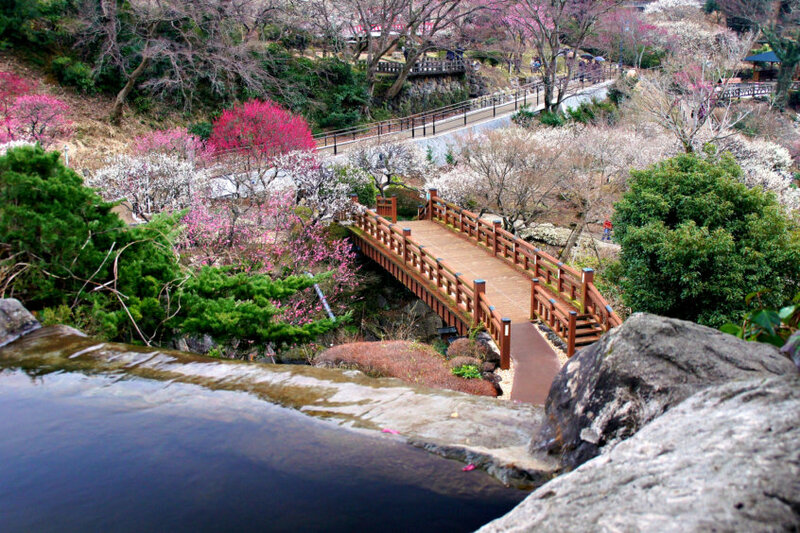 Within the garden, there are five Japanese garden bridges that cross over the Hatsu-kawa river. Atami Plum Garden holds an annual Atami Baien Ume Matsuri every year from early January to early March. 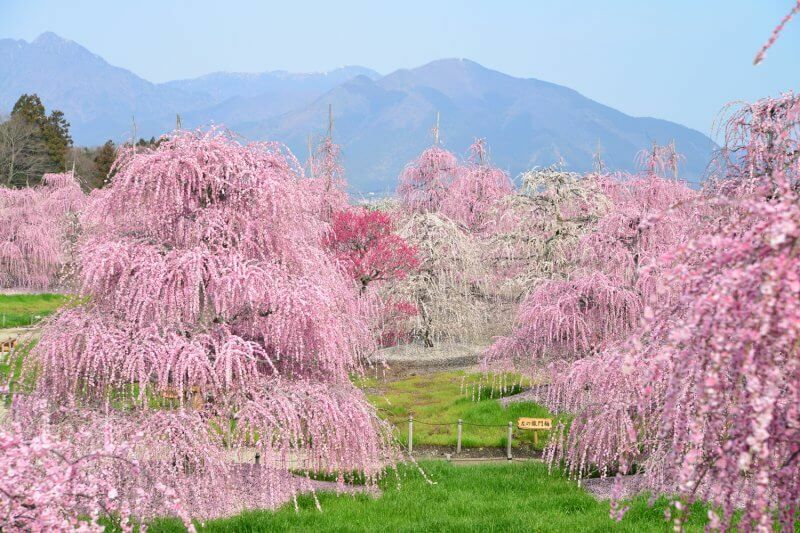 The Inabe Plum Grove located in Inabe City’s Agriculture Park is known as one of the best spots to view plum blossoms in Japan. 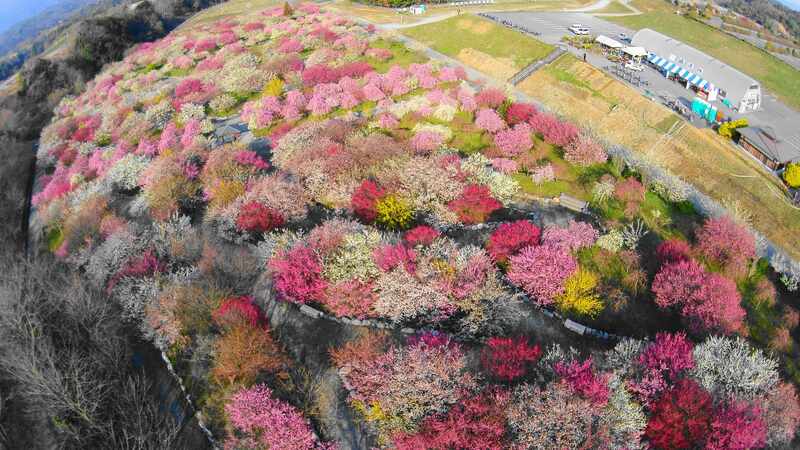 Over 100 kinds of approximately 4,500 plum trees are planted in the 380,000 square-meter space on the base of Suzuka mountain range. Visitors can enjoy the magnificent view of colourful plum blossoms and stroll in the grove with the great mountain view as a backdrop. The plum blossoms here are incredibly beautiful and attract visitors from all over Japan. The Inabe Plum Festival is held at Inabe Plum Grove every year for about 2 weeks when the flowers start blooming, in early March. The Dazaifu Tenmangu Shrine is a prestigious shrine in Kyushu that was built in 919, and the main shrine is designated as an important cultural asset. 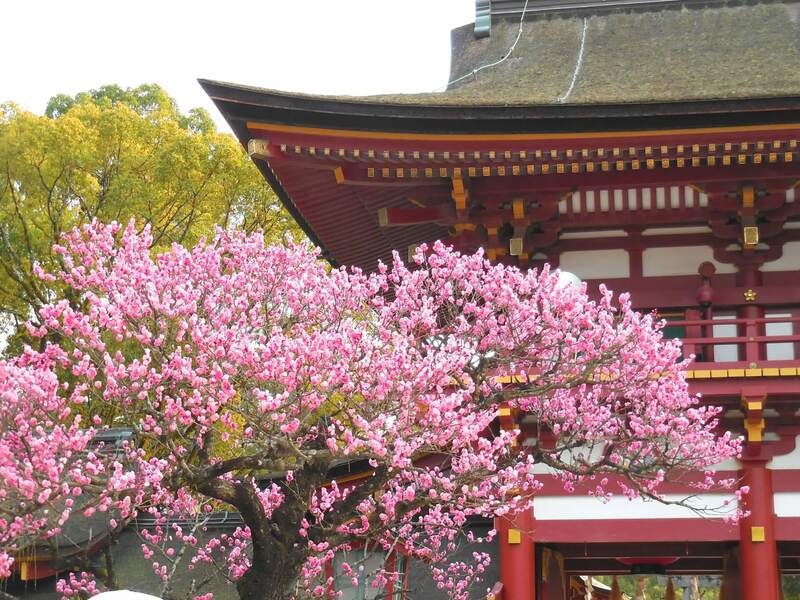 The shrine is famously home to the legendary “Tobiume”, an ancient white “flying plum” tree that is said to be over 1000 years old. According to a legend, this plum blossom flew from Kyoto in the early 10th century following a nobleman who was incredibly fond of plum blossoms. 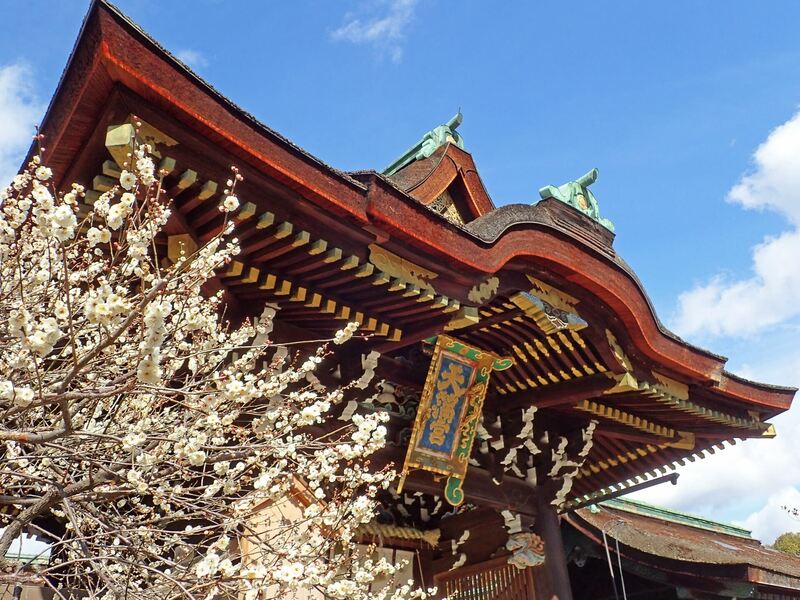 In addition to the Tobiume, there are also 6,000 plum trees on the shrine grounds that reach full bloom around mid-February every year. Suzuka no Mori Teien or Suzuka Forest Garden (鈴鹿の森庭園) in Suzuka City is one of the largest sites for viewing plum blossoms in all of Japan. The garden is famous for the 200 beautiful weeping plum trees that attract visitors from all over Japan. From white to vivid pink, plum blossoms in various colours flourish beautifully at the garden and create the picturesque scenery. During the blooming season, a light-up is also held at night which illuminates the plum trees until 9:00pm. Suzuka Forest Garden holds a plum festival every year from mid-February to the end of March. Kitano Tenmangu is a large Shinto shrine that is also is the most renowned plum viewing spot in the north side of Kyoto, Japan’s ancient capital. During the plum blossom season, the grounds of the shrine contains approximately 2000 plum trees of many different varieties. Every year on February 25th, the plum blossoms at Kitano Tenmangu Shrine are celebrated with a special outdoor tea ceremony called Baikasai. On this day from 10am to 3pm, hot matcha tea and traditional Japanese sweets are served by maiko (apprentice Geisha). The Misato Bairin is a vast hill in Takasaki City that’s covered by over 10 thousand plum trees. Along with the Haruna Bairin in Takasaki and the Akima Barin in Annaka City, Misato Bairin is one of Gumma’s Three Major Plum Forests. It is also widely considered to be the birthplace of east Japan’s first plums. 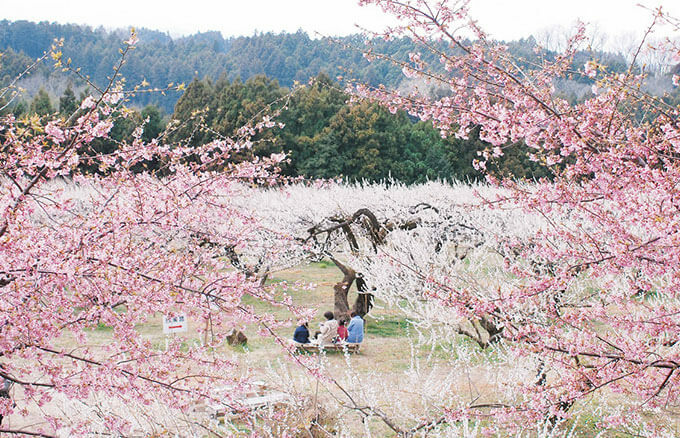 When the plum trees bloom in February and March, the entire plum grove is blanketed in a sea of pink and white. It is popular for those visiting Misato Bairin to come early enough ti witness the sunrise.